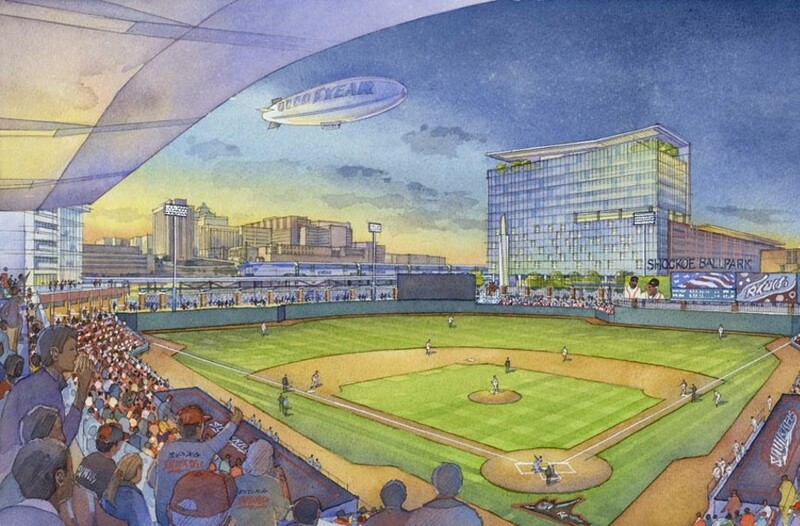 Architecture Review: The Shockoe Ballpark Plan | Arts and Culture | Style Weekly - Richmond, VA local news, arts, and events. Richmond's oldest neighborhood deserves a lot more planning than a rubber stamp for a baseball stadium. The Shockoe Bottom plan unveiled this month (shown here looking northwest from East Franklin and 18th streets) includes a ballpark and highrise construction. "This is just beginning of the public discourse," Kathy Graziano, 4th District councilwoman, reportedly said Nov. 18 as Richmond City Council began deliberations on Mayor Dwight Jones' redevelopment scheme for Shockoe Bottom. "Public discourse" is a telling choice of words because one of Graziano's council colleagues had told me the day before that council's collective mind was already made up: It has overwhelmingly bought into the mayor's limp plan for Richmond's most evocative neighborhood. Perhaps to Graziano, public discourse is just another pesky, but necessary, step — dealing with the citizenry — before rubber stamping the bizarre and bombastically overscaled plan that envisions a ballpark, apartment complex, hotel, grocery store and parking deck in the most ancient part of town. But as the discourse continues about our legacy of slavery, vehicular traffic, the future of AA baseball when we couldn't keep a AAA team, mom and pops versus big business, and who's getting what out of the deal, there's been little talk of imaginative and sensible design, historic preservation and architectural excellence. And there's been little talk of other options for the Bottom which, when you think about it, is already undergoing a dramatic and pretty cool transformation as apartment and retail is added monthly following market forces. The only section of the Bottom not feeling the love is the municipally-owned acreage and contiguous parcels affected by the mayor's plan. As public discourse continues, at least one fact can't be disputed: The city is abysmal at large-scale downtown development: Consider the dead zones around the convention center including the adjacent stretch of East Broad Street, the Coliseum and the bio-tech park. And don't forget the 6th Street Marketplace debacle. 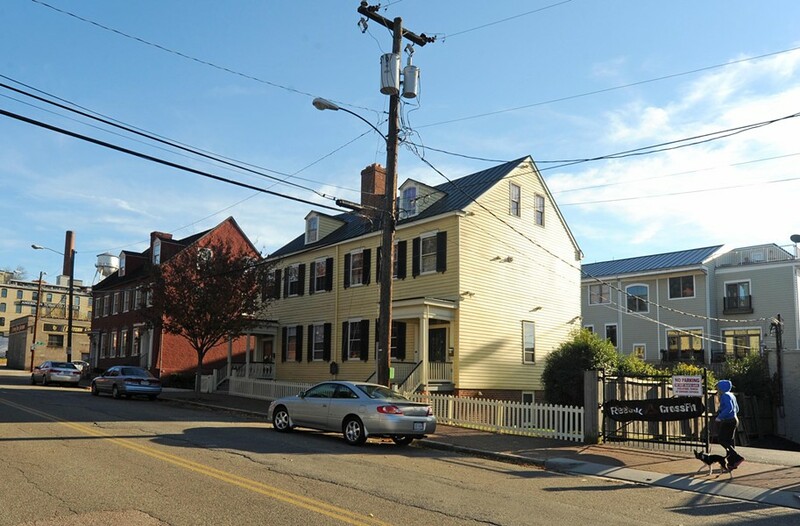 As a base line for considering how to build on the Shockoe Bottom blocks that flank the foot of East Broad, this property must be acknowledged as highly precious historically. The four square blocks — bounded by Broad, Franklin, 18th and 16th streets — where a void of a ball diamond is proposed, form part of the original footprint that Richmond's founder, William Byrd, and William Mayo, his surveyor, laid out in 1737 for the town's original grid plan. Those blocks should be kept intact as blocks. To obliterate them and co-join them into a super block would be akin to Philadelphia's savaging Society Hill, Boston's flattening North End or Baltimore's carving up Fells Point. Economist Jane Jacobs spurred the national preservation movement in the 1960s by saving historic swaths of Greenwich Village then threatened by a proposed cross-Manhattan highway. Have we learned nothing from her seminal book, "The Death and Life of American Cities"? A pedestrian walks her dog in the 1800 block of East Grace Street, past restored, 200-year-old houses and a half-block from where a stadium is proposed. Recently built infill residences are at right. Importantly, the neighborhood's full potential is greater than deciding what specific piece of sacred ground will commemorate the slave trade or any other project. All of the historic fabric — streets, sidewalks, alleys and existing buildings — should be preserved as a unit. What makes Shockoe Bottom such a beguiling destination is its status as our city's oldest and most evocative racial, religious, economic and transit crossroads with layer upon layer of history dating back almost half a millennium. So if City Council and review commissions can spend hundreds of hours annually approving sometimes modest changes or paint colors to individual historic buildings, shouldn't we start an open public discussion when our oldest neighborhood is threatened with a proposal endorsing an out-of-scale parking deck, hotel and stadium? The published architectural renderings of the mayor's plan are an insult to the historical and architectural character of our city. The 17th Street Farmers' Market is depicted as a meandering water feature a la Stony Point Fashion Park. The plan's blocky structures could be Anywhere, U.S.A. Shockoe Bottom deserves better. "What we're trying to do is light up the area and take out the dark corners and have more people downtown," Byron Marshall, the city's chief administrative officer, told the Richmond Times-Dispatch recently. Well, OK, add more streetlights. But suburbanlike development and another downtown dead zone will not attract people. Take this so-called development someplace where it will do less harm. I know that some applaud the stadium plan because it addresses flood-plain issues. Well, so would this: Restore the historic street grid, add sidewalks and create imaginative green and park spaces within now empty blocks. In lower Manhattan the miraculous High Line has enchanted and thrilled hundreds of thousands of people who have experienced the elevated park. A fresh approach to park design here could harness much of the Bottom's gritty charm, incorporating views of the belching interstate, Amtrak trains rolling north and south and low-slung buildings that, while harkening to another time now pulsate with the sounds and flavors of today. As Shockoe Bottom continues to get repopulated, open space will be a necessary as well as a popular amenity. To those who argue that Richmond can't look ahead, that it's mired in the past, I say think again. It's not the past — we're mired in architectural and urban design mediocrity. We've suffered a generation of memory loss in how urban, walkable cities function. So those who think this half-baked, uneconomical, and historically destructive plan is the best we can do, some advice: Get out more. 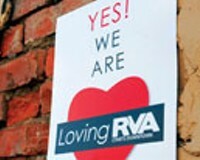 Richmond business interests take the lead in a pro-stadium campaign. 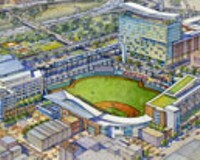 Mayor Jones unveils his grand plan for baseball in Shockoe Bottom.